What is the Citywide Plan? The Board’s Community of Schools Policy calls on us to reimagine our school system to ensure a quality school for all Oakland students. OUSD staff has presented an update on the Community of Schools Policy and the Citywide Map. This presentation is the first of several the Board will receive this year regarding the Citywide Plan. Currently, many of our schools are under-enrolled, are located in areas where few students live, or both. OUSD operates too many district-run schools for the number of students we serve; more than 10,000 seats are projected to be empty across 87 schools this year. Having too many schools with low enrollment prevents us from reaching the future we want for Oakland. Simply put, we are spreading our resources too thin. Maintaining the status quo will not improve outcomes for our students. Additionally, charter schools have played a role in educating Oakland’s students for the past 20 years and now serve nearly 30% of Oakland public school students at 45 charter schools. The District must work together with charter schools to make every public school option a quality option. Quality Schools in Every Neighborhood: By reinvesting in a smaller number of district-run schools, our remaining programs in every part of the city will be better resourced to meet the needs of 21st century students. Building on Our Achievements:More students are graduating, more students are reading at grade level, and fluency among English Language Learners is increasing. 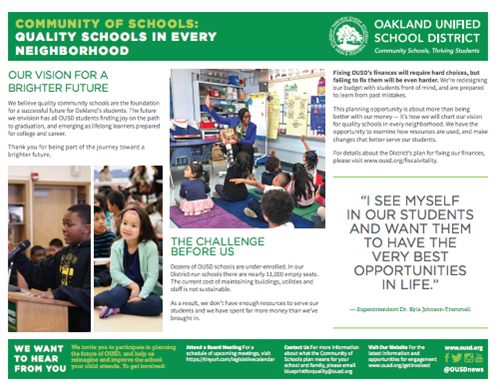 We’re positioned to build momentum where OUSD is already seeing progress, and open doors for new achievements across the District. 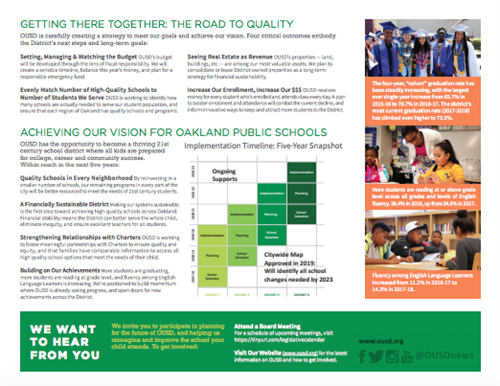 A Financially Sustainable District: Making our school district sustainable is the first step toward achieving high-quality schools across Oakland. Financial stability means we can better serve the whole child, eliminate inequity, and ensure excellent teachers for all students. Building Constructive Relationships with Charters: OUSD is working to foster meaningful partnerships with charter schools to ensure quality and equity. We want all families to have comparable information to access all high quality school options that meet the needs of their child. Click here to download the overview handout above.